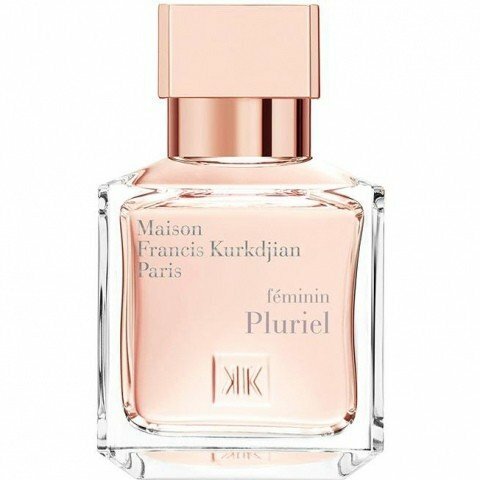 féminin Pluriel (Eau de Parfum) is a perfume by Maison Francis Kurkdjian for women and was released in 2014. The scent is floral-fresh. It is being marketed by LVMH. This is just downright lovely on me! I turned my head slightly just after spritzing because the scent wafting from my wrists was so alluring. A decidedly rare, unusually clean and delicate floral chypre as it reads on my skin. Every single note sings out distinct and pure in this composition, every single note takes a wonderfully positive turn on my skin, and yet, every note is masterfully woven together in a seamless silken blend that is altogether more than the sum of its parts, and an ultra-feminine joy to experience for me. Clean and clear the orange blossom, non-indolic jasmine, and startlingly intense, fresh-green un-wax-like lily of the valley florals herald the joyous opening here with no overdone soap or cleaning products evident. A cool and soil damp regal Iris emerges full force with a delightful shower of non-candied violet petals, swirled through with a crisply moist, just picked Rose de Grasse; the whole composition being impeccably balanced, and absent the overdone carroty powder bomb side effect. The patchouli support here is immaculately vegetal and restrained, adding depth with no tinge of musty-dusty offensive decompositional odor. The vetiver is wonderfully blended so as to bolster things with a hint of the most delicate citric-spicy-woodiness, and cool earthy support. The balance between the vetiver and the patchouli is just flawless in enhancing the refined sensuality of the whole without overwhelming it. The entire scent make me think of strolling through an enchanted fairy forest at dusk with all sorts of little magical creatures glimmering in the shadow. I find that Maison Francis Kurkjian is growing to be my favorite house. So far, I absolutely love everything he has done. Notes that I ordinarily dislike in other perfumes, I find to be clearly present, and yet not only completely inoffensive, but marvelously realized by an astonishingly skillful blending of exceptionally high quality basic ingredients. I’m definitely getting a full bottle of this one, and the scented cream as well.